Indian bulletproof fat drink- Better "bulletproof coffee"
Indian Fat Drink or Indian bulletproof is your answer for an awesome and tasty bulletproof coffee alternative. 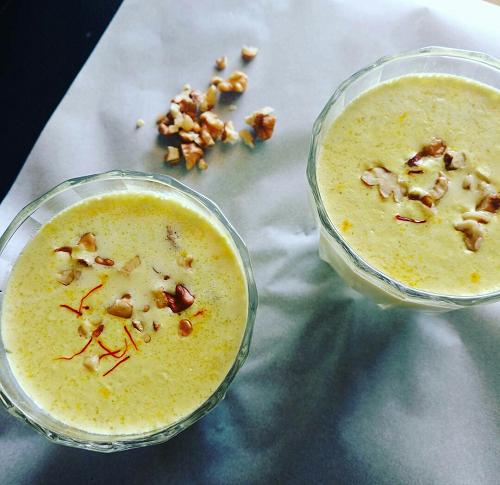 So, to share about the recipe- It is made from coconut milk and ghee with some other ingredients. Indians reading this post must have guessed that the picture looks like ‘Masala Doodh’ , meaning spiced milk literally. This is very near to the taste of masala doodh but full of fats and very low in carbs. Glass full of this in the morning and you will be so full till afternoon. Let’s straight go to the recipe ! If you have a quality grade ghee like the grass-fed variety of Pure Indian foods (people outside India) or Amul Ghee (Indians), and some Hommade Coconut Milk, 200ml – you made yourself a glass full of satisfaction. You can get the macros for this drink and can track them in Myfitnesspal too or the macros are listed below at the end of the recipe. Log this drink on your myfitnesspal account ! Indian Fat drink- Better than "Bulletproof Coffee"
Indian Fat drink to replace that bulletproof coffee, full of fats and super low in carbohydrates. Try the new Indian Bulletproof drink ! Take the coconut milk in the pan and heat it to bring to a boil. Keep stirring it continuosly as it tends to stick to the pan. Add the melted ghee and coconut oil along with cream and mix properly. Cook for 2 minutes and let the fats emulsify properly. Add the sweetener along with cardamom powder, turmeric and give that a stir. Add the saffron milk and give it a good mix for 5 minutes. Who should have this drink ? Who should not try this ? What Products I used for this Indian Bulletproof? Yum! This is the bomb! Either you, or Pratichi, need to adopt me ASAP. I’ll behave. I promise. This looks so yum. Thank U so much Ankita for this amazing recipe…. Just loved it… All those who hate taking regular BPC please do try this ??? I loved the chilled version … It was so yummy and felt like cheating ?? It tastes just like badam milk. I’ve had this both hot and cold. Both are yummy. Thanks for the recipe ankita. Hi Ankita, looks amazing as usual! I just wanted to stop by to let you know that I nominated you for the Versatile Blogger Award, your content is great and I always enjoy reading. Thank you for your lovely posts and for all of the support you have shown me since I started my blog! 🙂 Love the new site, by the way! Hey sorry, saw your message now. So frm where do I get the badge ? This was so yum I’m never having bulletproof coffee! You can substitue it but the idea of the drink is to have it daily in place of a bulletproof coffee. You cannot have almond milk daily as it is high in calories and is inflammatory too. Have it once in a while with almond milk. Can I replace coconut milk with Almond Milk? Yes, you can but the fat content will be low. What are nutes? is that a typo for nuts? If so, what kind? It looks tasty. Haha yes. It is a typo ? Thanks for the recipe! I do not wish to add artificial sweetener… Can I do away with the stevia and yet enjoy it without it tasting so bad?